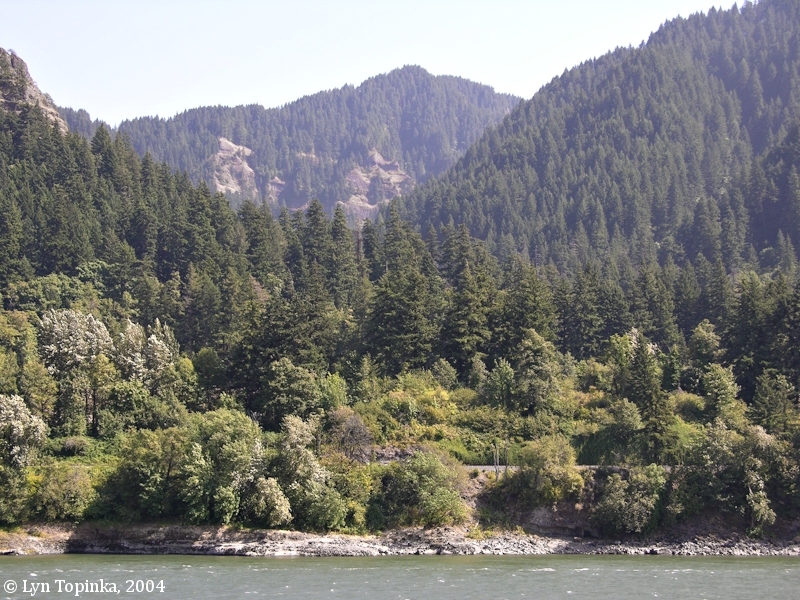 Click image to enlarge Moffett Creek drainage, Oregon, from Hamilton Island, Washington. Image taken August 1, 2004. Moffett Creek merges with the Columbia River at River Mile (RM) 144, just downstream of Tanner Creek and Munra Point, and upstream of McCord Creek and the Oregon community of Warrendale. Directly across from the mouth of Moffett Creek is Hamilton Island, Washington. The mouth of Moffett Creek lies within the John B. Yeon State Park. Wahe Falls, often known as "Moffett Falls" or "Moffett Creek Falls", plunges 80 feet over basalt. 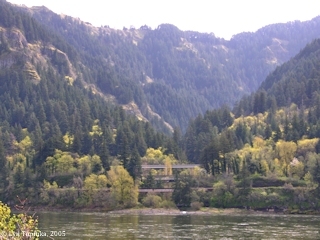 It is located less than a mile upstream from the where Moffett Creek merges with the Columbia River. "Investigation by H.H. Riddell of Portland indicated that the family for which this stream is named spelled its name Moffett and not Moffatt. The Historic Columbia River Highway crossed Moffett Creek on a remarkable concrete arch. At the time it was built, it was said to have been the longest three-hinged, flat-arch bridge in America. This bridge, now unused, is still standing just north of I-84." The U.S. Bureau of Land Management's General Land Office (GLO) Records database shows a Walter Moffett being granted title to 69.5 acres of T1S R1E Section 21, on April 15, 1864 (1820 Sale-Cash Entry). Robert A. Habersham's 1889 Multnomah County map has Moffett Creek labeled "Beaver Cr.". Nearby McCord Creek us unnamed, while upstream "Tanner Cr." and "Eagle Cr." are shown. "... At MOFFET CREEK, 151.4 m., the highway crosses a large flat-arch cement bridge. The span, 170 feet long, is 70 feet above the stream. ..."
The Moffett Creek Bridge was built in 1915 as part of the Columbia River Highway and was known as an engineering feat of the time. The 170-foot-long arch rises only 17 feet at the center. 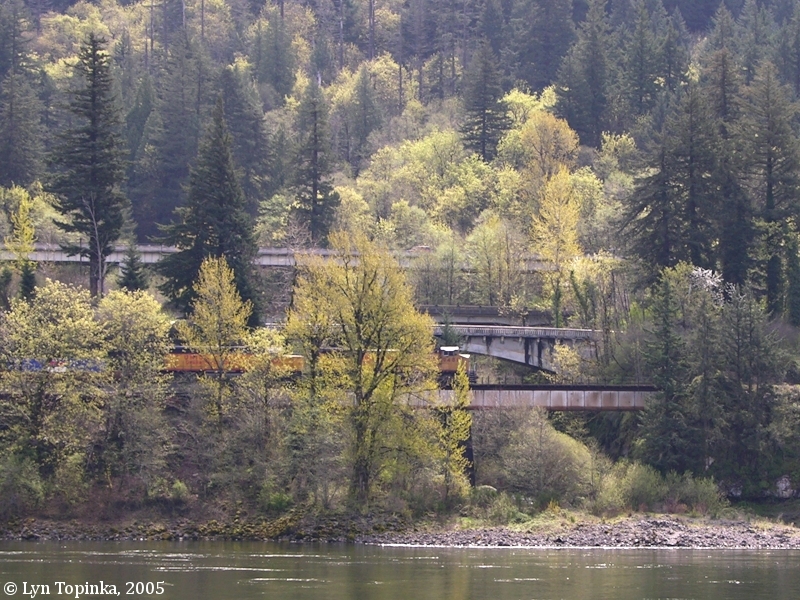 Today the bridge is a part of the Historic Columbia River Highway State Trail. Click image to enlarge Penny Postcard: Moffett Creek Bridge, Columbia River Highway, Oregon, ca.1920. Penny Postcard, ca.1920, "Moffats Creek Bridge, Columbia River Highway.". Published by Pacific Novelty Co., San Francisco, California. Card #O-106. In the private collection of Lyn Topinka. Click image to enlarge Moffett Creek, Oregon, from Hamilton Island, Washington. Image taken April 2, 2005. 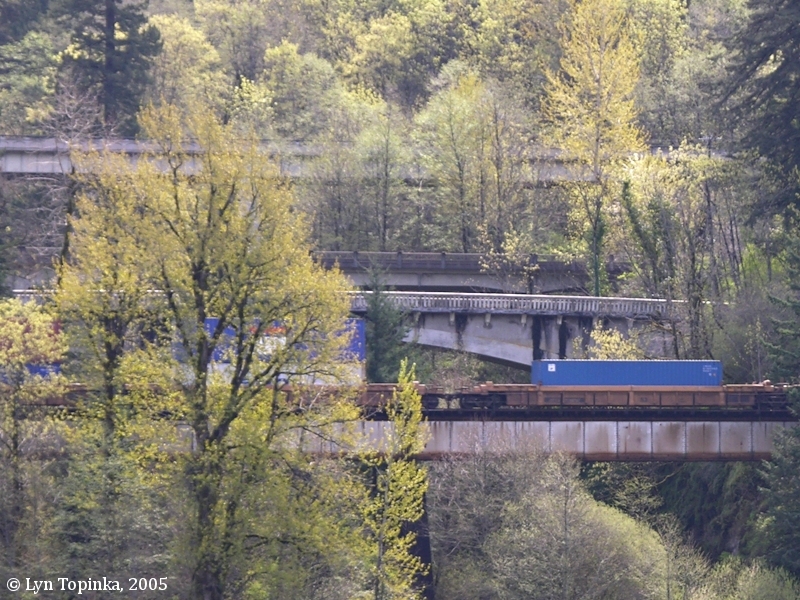 Click image to enlarge Bridges across Moffett Creek, Oregon, with train. View from Hamilton Island, Washington. Image taken April 2, 2005. The early 1900s was the "Golden Age of Postcards", with the "Penny Postcard" being a popular way to send greetings to family and friends. Penny Postcards today show us a snapshot of history. Click image to enlarge Penny Postcard: Moffett Creek Bridge, Columbia River Highway, Oregon, ca.1920. Penny Postcard, ca.1920, "Moffett Creek Bridge. Columbia River Highway, Oregon.". Image copyright Weister Co. Published by Van Nuy Interstate Company. In the private collection of Lyn Topinka.